Like a multi-vitamin for your liver! Critical Liver Support improves liver function and provides therapeutic liver protection. The liver is the largest, and one of the most vital organs in the body. Without it, we would die within 24 hours. It plays a role in many important functions; including making vital substances such as cholesterol, blood proteins, clotting proteins and lipoproteins. It is also involved in blood filtration, bile production, production and break down of hormones, regulation of blood sugar, and detoxification of endotoxins (internally produced) and exotoxins (environmental). These are just a small list of functions that the liver plays a role in. Protecting the liver against damage with powerful anti-oxidants. Critical Liver Support does all 3 of these important tasks. What is Critical Liver Support? 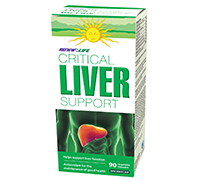 Critical Liver Support improves liver function and provides therapeutic liver protection. It is formulated for anyone looking to ensure optimal liver health. Critical Liver Support consists of powdered herbs and amino acids delivered in vegetable capsules. Critical Liver Support improves liver function and provides therapeutic liver protection as well as antioxidant protection. The ingredients in Critical Liver Support have also been shown to have a positive effect on the reduction of elevated blood lipid levels. The liver is the largest, and one of the most vital organs in the body. Without it, we would die within 24 hours. It plays a role in many important functions; including making vital substances such as cholesterol, blood proteins, clotting proteins and lipoproteins. It is also involved in blood filtration, bile production, production and break down of hormones, regulation of blood sugar, and detoxification of endotoxins (internally produced) and exotoxins (environmental). These are just a small list of functions that the liver plays a role in. Optimal liver function is vital in order to deal with the abundance of jobs it is required to perform. If the liver is not in good health, it can become sluggish and result in congestion or poor functioning. You may notice an increase in energy and overall vitality, as well as a lowering or stabilizing of cholesterol levels. Directions for Use: Take 1 capsule three times per day. Take with meals providing protein. Use for a minimum of 3 weeks to see beneficial effects. Consult a health care practitioner for use beyond 6 months. PLEASE NOTE: Critical Liver Support contains no dairy, wheat, gluten, soy, corn, yeast, additives or preservatives. Renew Life does not use genetically modified ingredients. All ingredients are NON-GMO. Warnings: Discontinue use if you develop symptoms of liver trouble (abdominal pain, dark urine, jaundice). Consult a health care practitioner prior to use if you have diabetes, gallstones, stomach ulcers or excess stomach acid, have a history of non-melanoma skin cancer, are taking blood thinners, antiplatelet medication or protease inhibitors, if you have cystinuria, or are taking nitroglycerin, or if taking antibiotics. Do not use if you are pregnant, breastfeeding, if you have a bile duct obstruction and/or if you have liver or gall bladder disorders, and /or bowel obstruction. Hypersensitivity has been known to occur; in which case, discontinue use. 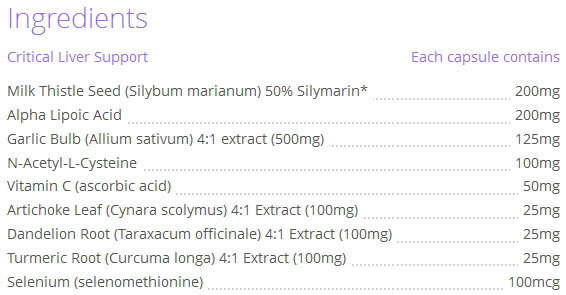 Do not use if you are allergic to plants of the asteracea/compositae/daisy family. Keep out of reach of children.